Roasting beets concentrates their natural sweetness. 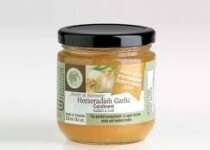 A good drizzle of Horseradish Garlic Condiment at the finish puts them over the top. 1) Heat oven to 350F. Wash beets well, leaving on skins. Remove the greens if attached and reserve for cooking later. 2) In a baking dish (or wrap in foil) toss beets with oil, garlic, salt and pepper. 3) Bake 45-55 minutes until beets are tender when pierced with a fork. 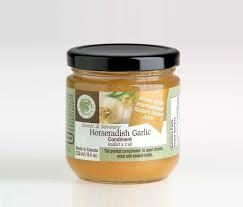 4) Remove from oven and toss with Horseradish Garlic Condiment.